Red is the colour of ROAR!!! I must be a tiger on the inside, as this is the second red 1950s dress I've bought in as many weeks. I was thrilled to find this one, a true shelf bust wiggle dress, in my exact size. I've had this fabulous rhinestone necklace stashed away for far too long, hoping to find the pieces it needs for repair. 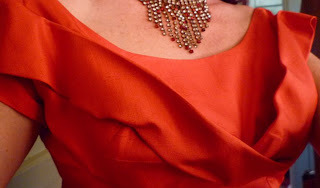 It's too lovely not to show off...and wearing beautiful red things always makes us feel more beautiful, doesn't it? Why not make your weekend a special one? 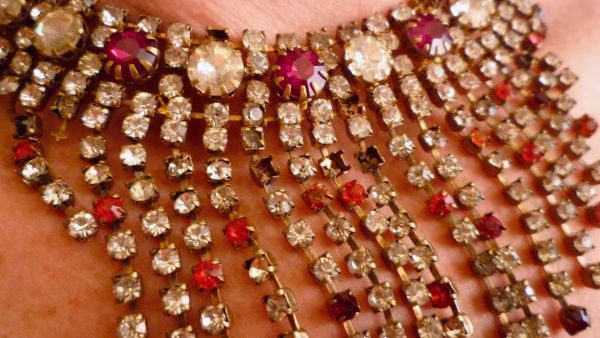 Go on, wear one of your treasures and make yourself feel beautiful. YOWZA, woman you look sizzling hot in that stunning frock. Bona fide Hollywood silver screen starlet pin-up material. Your fiery locks & fabulous figure really bring that frock to life. It is truly stunning and you've styled it impeccably with that gorgeous rhinestone necklace and cheeky peep-toe heels. BRAVO! You look amazing - what an incredible dress! The only thing it's missing is a cocktail. Holy SHITBOX,you are SMOKIN' in this gorgeous frock!!!OMG! A real siren!The hair is sublime,and the diamantes are heavenly!!SQUEE! Woot woo! Looking good! That is a stunning dress and it looks fantastic on you. Not much more I can say other than STUNNING. ARGH-mazing!!! I have a few shelf dresses with full skirts, myself. 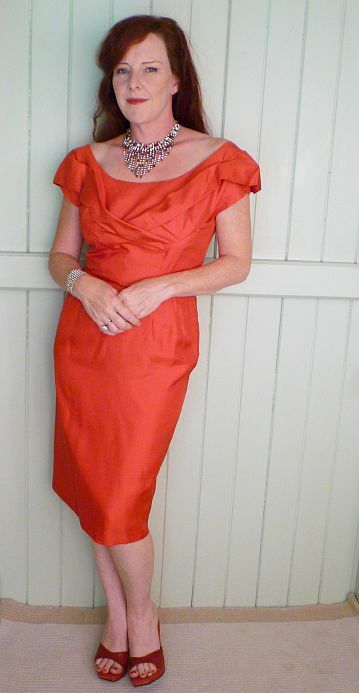 I have been on the hunt for a shelf dress pattern, so I can make dresses up in fabulous fabrics, like this racey red. *ROAR* You are Rooooarring in red kitty. The dress looks beautiful on you as does the necklace. Oh Kitty you just purr in that fabulous dress, gorgeous!!!!!!!! Wow when you wear a great red dress that makes you feel amazing it really is beautiful.